All you need is one monitor, a CPU, a keyboard, a shopping trolley and urmmmm a really, really, really long extension cable and you're all set on your way to owning your own portable computer, just like the one below. Oh, the printer is optional by the way ... LOL! This morning while waiting for the boys to finish Sunday school, wifey and me went to the nearby hypermarket to pass the time like we always do. While walking from aisle to aisle looking at stuff, we came across that cheap portable computer solution and I just couldn't resist taking a picture of it. That unit was used by the staff of the hypermarket to do price checks on their products and we actually came across this a few months back. 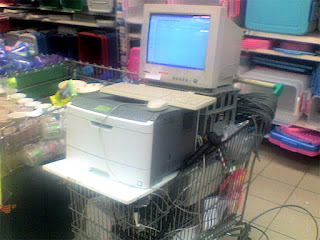 The first time I saw the person pushing this huge bulky trolley along with the monitor, CPU, keyboard and printer trailing a really long extension cable, I burst out laughing and wanted to take a picture of it but was stopped by wifey cos the person pushing the trolley was staring at the both of us. I suppose the fact that I was laughing away hysterically had something to do with it. Then the opportunity arose again today and this time the trolley was unattended to and no way was I going to miss the opportunity to snap a pix of it :D I wonder if the management of this place knows of the existence of portable computer devices called laptops? LOL! But I must applaud them for their ingenious way to make their own portable device. At least if they decided to go for a holiday in some San Diego hotel they can bring their portable device along. Whoa, I can already imagine the length of the extension cable they would need! Hahaha! I guess, this is just one way to cut cost of having to buy a laptop. LOL! If I'd seen that in the supermarket, I'd have been laughing hysterically too. You and wifey go to Hypermart every Sunday? That's very sweet of you. I can't get my husband to step into any grocery store with me, so what's your wifey's secret? PS: Star Trek, yeah I'm waiting for the movie too. The preview looks really good!!! Hahaha! I am actually laughing Nick, looking at the pic! Carol - I should have thought of this before getting mine ... LOL! Perky - That would be an awesome sight wouldn't it? So canggih! LOL! Deana - Obviously some people don't think so ... LOL! saving budget is the only excuse i can come up with. Terra Shield - You WOULD have laughed your head off too, I'm sure of that ... It was just begging to be laughed at ... LOL! I dreamed of having my own laptop..but I'm not sure if i want this kind of portable computer. LOL! Mama Mia - Hahaha ... and neither would I but yeah, it's kinda creative la. Laptops aren't very expensive these days. Mei Teng -Obviously no one told them that! LOL! LOL! Notty la u laughing hysterically at the fella that first taim lol!! A genius, I thought so too ... LOL! What a genius invention. Laughing out loud inside my room. Why don't just buy cheap laptops on the market instead of building that type of computer. That's totally hilarious.